Deep Drill #1 1914: The Valle Mining Company decides to prospect for ore deep in the Bonne Terre Formation. "Does the Viburnum Trend extend this far north?" 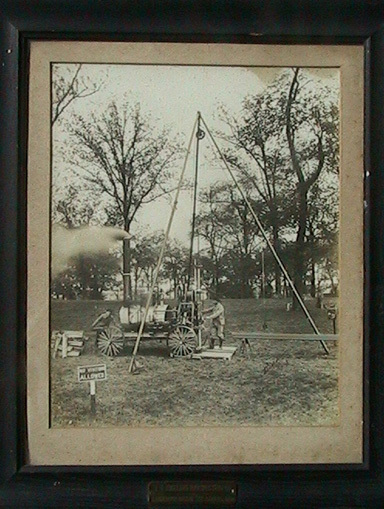 A steam powered diamond core drill at the time was the only way to go. At first, the day proved nothing. Over and over, the decision came down. "We'll go deeper!" 100, 200 400, 800 feet deep they drilled, still nothing. Then came that sound. The sound of water... At 840 feet they struck an underground artesian river, not just a well, but a river and water came gushing out at 75 gallons per minute, enough to fill a modern day drywall bucket in 4 seconds. Deep Drill #2 Not only did they strike water in Drill Hole #1 but a mile away in Drill Hole #2 they struck 6 feet of lead. Although the largest lead nugget at Valles Mines was the size of a Volkswagen Beetle, this would be even bigger. 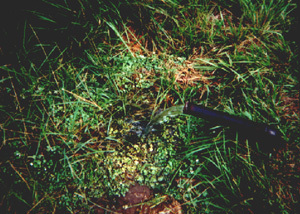 No one ever pursued this prospecting discovery and Drill Hole #2's exact location has been lost. However, based on old maps and surveys, it is located about 100 feet south of the Frazier Quarry (formerly the Big Bill twin shafts) towards the Big Lode Mine. The precise depth of the strike was never determined either. IT remains a project for a metal detector as the iron casing that guided the drill remains in place waiting for its rediscovery.